Review: I’m getting old. I mean, that’s really the only explanation because I think if I’d have seen Don’t Breathe a decade ago I would have given it practically a perfect score. But…I’m older and, I think, wiser and my better judgement tells me that while this home invasion thriller hits many of the right notes (and, for a good stretch of time creates a near-symphony) there’s something overly slick about it that keeps it from being the true horror masterpiece the poster quotes would have you believe. Still, in a summer with box office duds that are horrors unto themselves (I’m looking at you, Suicide Squad), Don’t Breathe arrives in the last gasp of August with some refreshingly fresh air. I simply hate movies that start out with a flash forward to the end of the film only to fold back on themselves and take you back to how it all began. While I don’t often read other reviews in full before catching a screening, my #1 trusted reviewer Brian Orndof mentioned in his review that it would be a good idea to arrive a few minutes late so you miss what might be considered too much of a spoiler. I’d go further and say you should arrive a full fifteen minutes after it starts because the opening stretch of Don’t Breathe is pretty terrible. Bad acting, bad exposition, and bad dialogue had me wondering if we’d all been pranked into thinking this was horror on a higher level. Three teens spend their aimless days breaking into houses in the Detroit area, committing petty burglary not so much for the monetary benefits but seeking some kind of thrill to break up their dead end lives. Rocky (Jane Levy, Fun Size) and Money (Daniel Zovatto, It Follows) would likely think of themselves as a modern day Bonnie & Clyde…if I believed they had any clue who the doomed burglars were. Tagging along is Alex (Dylan Minnette, Goosebumps) who not only holds an obvious torch for Rocky but the keys to the security systems his dad oversees. When Money gets a tip on a score big enough to get them out of town, the trio decide to stage one last heist before retiring to a sunny life in L.A. Located in an abandoned neighborhood, the house they set their sights on belongs to a blind veteran (Stephen Lang, The Nut Job) who, aside from owning a cranky Rottweiler, appears harmless. Breaking into the house is easy…but getting out is another story. It’s best to keep the details slim about what happens over the next 75 minutes but rest assured that right about the time you think you know what’s coming next, the tables get flipped and then flipped again and then broken apart and then the pieces thrown at you. 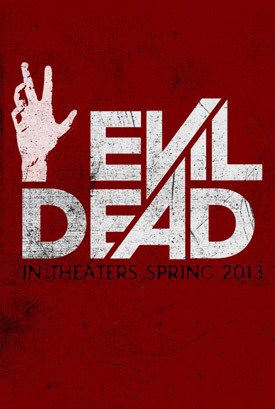 Much like their Evil Dead remake in 2013, high points go to writers Fede Alvarez (who also directs and reteams with his Evil Dead star Levy) and Rodo Sayagues for keeping things unpredictable until the very end. This isn’t nearly as gory or bloody as Evil Dead was, but it has head-spinning, armrest clenching, and eye-covering shocks all its own. As original as the film is, it has a few flaws mostly involving pacing and performance. Even at a trim 88 minutes it feels slightly slack in the opening half, saving the major adrenaline thrills for right around the mid-point before sputtering through multiple endings. While Levy and Lang make for prime prey and predator, Minette is bland and Zovatto’s thug comes across like a parody done better on SNL. Lang’s blind veteran eventually takes shape as an unstoppable force ala Jason Voorhees or Michael Myers, and though I applaud Alvarez for letting the actors appear bruised and bloodied the “takes a licking and keeps on ticking” trope feels worn out by the final credits (which, by the way, are impressive). For horror aficionados, Don’t Breathe may be the summer movie they were most excited to see and for that, it doesn’t disappoint. It may have some cracks and creaks to it but the house that Alvarez and company build mostly holds up to the storm. Review: Sam Raimi’s 1981 horror classic The Evil Dead was a great example of doing a lot with very little. With practical effects that completed the overall homemade “let’s make a movie” vibe, the film is a rough and tumble raucous romp filled with the right amount of comedy and horror. When this ‘new vision’ of Raimi’s seminal piece was announced, it set the horror hounds on the project until Raimi (Oz The Great and Powerful, Indian Summer) and original star Bruce Campbell gave the production their valued blessing. 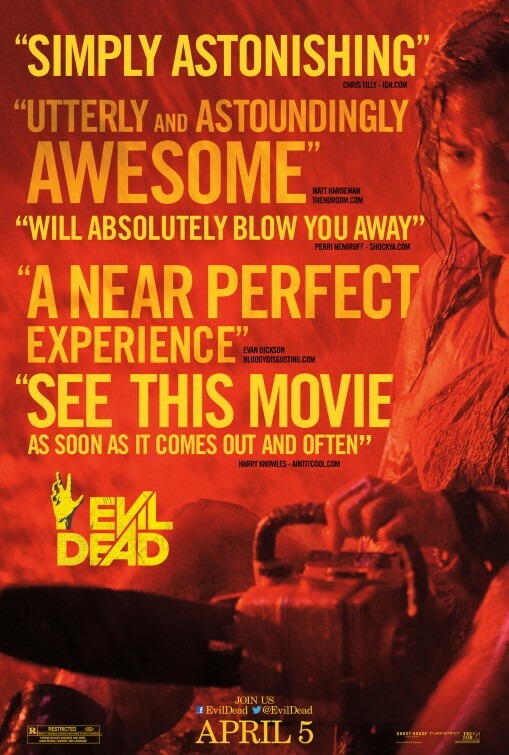 After seeing the ooey, gooey, and oh so bloody final product (which drops the “The” to be just Evil Dead) it’s not hard to see why Raimi and Campbell liked the film so much. Though like the original it’s less concerned about a coherent plot, it delivers what scare junkies crave so much…blood….gallons and gallons and gallons and gallons of it. I don’t think I’ve yet seen a horror film with quite so much of the red stuff used to such delirious effect. Not an outright remake but more of a re-imagining of the story, director Alvarez collaborated on the screenplay with Rodo Sayagues, later bringing in Oscar winner Diablo Cody (Juno) for some revisions. The set-up is still the same: five friends drive deep into the woods to stay at a ramshackle cabin and meet up with hungry demons over the course of one very gory weekend. In the 2013 version, it’s not a simple weekend getaway but a detox/intervention for Mia (Levy). Her estranged brother David (Fernandez) and his girlfriend Natalie (Blakemore) are present as are friends Eric (Pucci) and Olivia (Lucas). See if the first letters of their names spell anything interesting, why dontcha? With probably ten times (at least) the budget of the original, Alvarez and company have designed a crack production design, complete with dilapidated cabin that has an ominous trapdoor to a very scary basement (it looks an awful lot like The Cabin in the Woods actually). Wisely choosing to mostly stick with the practical effect model of the original, the special effects crew has their work cut out for them as the cast members are stabbed, shot, beaten, eaten, sliced, and diced over the 90 minute run-time. This is so not a film for children or the faint of heart – a member of my group gagged at one point at the shocking level of gore on display and I know that I had several moments twisting around in my seat from sinews being stretched and limbs being hacked. The make-up design is first rate…as the film progresses and members of the quintet are possessed by evil their eyes glow, their skin cracks, and a lot of other unpleasant things befall their nubile bodies. One unfortunate takes multiple lickings and keeps on ticking…resulting in some comical happenings the more they turn into swiss cheese. With a film riding this heavy wave of gore, you need a cast that give themselves fully to the material and Alavarez has put together a group of young Hollwood-ites that squeal happily as they toss themselves through the razored ringer. Levy is most impressive as the detox-ing Mia who gradually becomes a catalyst for all things demon related while Pucci takes a needle to the eye like a pro. The barely there plot is really just a ploy to put our actors into harm’s way so try not to get too bogged down in the developments. True, the acting isn’t bad considering the genre but if Cody was brought in to punch up the script I can only imagine what it was like before she arrived. Alvarez is a slick filmmaker and he makes great use of lighting, a diverse orchestral score, and a constantly moving camera to keep you on the edge of your seat. He also includes several subtle nods to the original film – I caught a few but missed some too. Though the film has about four endings, it’s the final one that should give you every penny of your hard-earned dollar that you plunked down to see it. I don’t want to give away any spoilers but it culminates with a moment that had the audience I saw it with cheering and applauding louder than I’ve heard in some time. If you’re a fan of old-school horror films where the emphasis is less on a deeply developed plot and more on just making you squirm in your seat you’ve found a film to rejoice over because it’s a rollicking ride for those that have the stomach for this kind of movie-going experience. Make sure to stick around for well-designed end credit sequence and a nice stinger before the lights come up. Synopsis: Mia, a young woman struggling with sobriety, heads to a remote cabin with her brother and a group of friends, where the discovery of a Book of the Dead leads to danger and horror. Thoughts: With horror remakes being all the rage, it was probably only a matter of time before someone sunk their teeth into a remake of Sam Raimi’s 1981 schlock fest that has attracted a cult following since its original release. Made on an ultra low budget, the film inspired several sequels and launched the career of the fledgling director. With Raimi and original star Bruce Campbell’s blessing, first time director Fede Alvarez has remade Evil Dead for a new generation. The Red-Band trailer promises a hyper violent, super gory remake that may just satisfying the naysayers who blanched at the idea of updating what someone consider a classic staple of horror cinema. I’m not usually on board for straight remakes but aside from an opening that resembles Cabin in the Woods, this one looks mighty fine.